Now that we understand the underlying problem causing Narcolepsy, we can better understand how the symptoms of narcolepsy all stem from a blurring of sleep and wakefulness. Keep in mind that not all people with narcolepsy have all of these symptoms, and the severity of each symptom can vary greatly from person to person. EDS consists of feelings of general sleepiness at various times throughout the day, as well as periodic episodes of sudden sleep (also known as “sleep attacks”). Each of these are caused by a lack of night-time sleep, as well as the brain falling into phases of sleep during waking hours. Cataplexy refers to a sudden loss of muscle tone that is usually brought on by “extreme emotions”, commonly laughing or fright. Many who experience cataplexy believe it can also be influenced by non-emotional triggers (e.g. stress or environmental factors). Cataplexy occurs when the brain confuses waking life for a dream-state, and tries to paralyse the body to prevent it from acting out the “dream”. These episodes can vary greatly in length and intensity, encompassing everything from momentary head-dips or knee-buckles to extended periods of paralysis. Most people with narcolepsy will not have a problem getting to sleep, but staying asleep through the night is another issue. The irregularity of narcoleptic sleep cycles means that the brain will be trying to cycle between wake and sleep throughout the night, and can make it impossible to simply go back to sleep. These problems with getting enough sleep at night will usually worsen daytime sleepiness. Automatic behaviour describes when a person enters REM while still “awake”, meaning that they can still function, sometimes even talking, without noticing they aren’t fully conscious. This symptom can actually be one of the more dangerous, with some patients reporting they have driven cars or had kitchen accidents while in this state. These typically occur while a patient is falling in or out of sleep. Put simply, they occur in a state between wakefulness and sleep, where you are dreaming while technically still awake. Hallucinations that occur while falling asleep are known as “hypnogogic” and those that occur while waking up are called “hypnopompic”. These hallucinations can involve seeing, hearing and/or feeling things that aren’t really there. 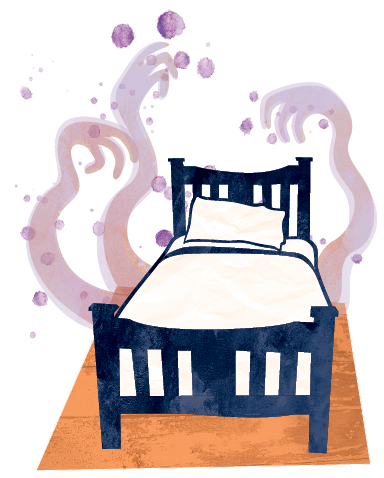 Similarly to hypnogogic and hypnopompic hallucinations, sleep paralysis is experienced when falling in or out of sleep. It refers to a temporary period in which you are awake but your body is still paralysed (as it is during REM sleep). These periods can last anywhere from a few seconds to many minutes, and can occur together with hallucinations, which can make it particularly frightening.